#modelboats – Exciting times in model boat racing in Ireland as a new class is launched. Although the A Class was born in the early 1920's the design barely survived as faster slimmer classes emerged but these boats are simply beautiful writes Gilbert Louis. Two Irish model boat sailors travelled to the PRACC event in Portishead. The Birth of the A Class in Ireland. Brian O'Neill and Gilbert Louis travelled on Saturday to Rosslare to hop on the ferry to Fishguard. Another 3 hour drive later we arrived at the pond near the seaside. Time for Gilbert to meet Graham from the UK who he bought his first A class. It's 17:00. Graham rigged up the boat for me and we put her on the water for a first test sail. First impression? 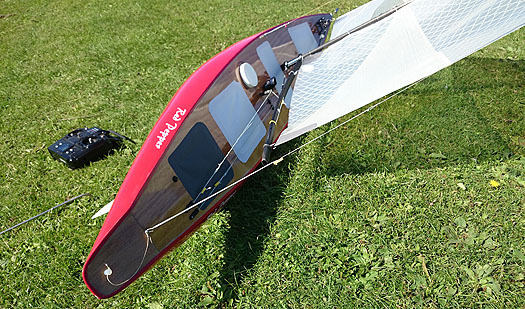 It's not an IOM boat – first feeling, I can feel the weight (my boat is 14.7Kg) so it doesn't quite accelerate like an IOM boat (4 Kg) nor handle like one. It feels like a small keel boat actually. And like a full size keel boat you got to let the sheet off quickly as you bear away or the boat won't bear off. They're no sluggish monsters either. The wind is rather light as the evening sets in and Brian joins me with his A Class. But they carry their speed very well indeed and surprisingly they go well in light wind conditions. My new A Class is a Sweet 9, an evo from Peter Stollery original design by Peter Wiles. The same design as Brian, but mine is slightly lighter. Contrary to IOM class rules the A class rules are more similar to the 12m JI of the glory years of the America's cup (before more politics and solicitors got involved). Sorry just slipped there! So even boats of a same design and builder can have a different weight and sail area. The boat weight and water length impact on the sail area so it all works out at the end. A lighter boat may be more interesting but then you'll have less sail area whereas a heavier boat will be allowed more sail area. Bear in mind I am hugely simplifying the concept of the rules here so it is easier to grasp. As the light started to fade we packed up for the evening and headed to our hotel. They do have a great Italian restaurant there ! Not good for the waist line ! 7:00am Sunday morning, last top of of he battery charge, a breakfast on the go and we drive to the pond. We were the first 2 at the pond and there was a reason for this as we both wanted to get as much practice as we could before the racing starts. We both opted for the light A sails. It is worth noting that in the A class we typically only have one rig and we change the sails. The wind is light which suits me down to a T with my lack of experience sailing these majestic boats. Competitors are arriving and shortly we get more boats on sailing on the pond as each skipper is trying to get a quick tuning time on the water before the skipper breifing. So far I had no idea where I would finish and that was exciting. I started with light pressure on the shrouds but a good bit of backstay to get a nice twist on the main. Wrong I quickly found out that it was bending the mast too much and flattening the sails too much for the light wind. Race one was now over so time for a quick tuning change before race 2. release the backstay to straighten the mast, fill the main but now the leech is too tight for my liking. So release the kicker to open the leech. Race 2 starts. I find myself naturally getting in the pre-start battle but try to stay clear. The last thing I want is to get entangled with another boat. I'm still learning to sail those beautiful boats afterall. With the pond shape and the wind direction it feels more like a drag race making the start so important to get away and have the highest chance to round the weather mark. The wind has a tendency to go right in the middle of the beat. The starting line is favored at the pin end but then you are at the risk of sailing into that header and with the rest of the fleet coming just behind on starboard, that's race over before the first mark. But I like risk and saw the benefit of that header but this meant having an excellent start at full speed at the pin end to have sufficient lead to have time to tack on port and cross the fleet and the temptation was too strong to refuse. So I obliged and though it did almost work a few times (yes I can be stubborn at time) I got caught up in the pack of starboard boats if I wasn't fast enough to pull away quickly after the start and execute a smooth tack. It did pay off twice though and allowed me to reach the weather mark first. In the afternoon as the wind picked up Brian changed to his heavy A suit and that paid out for him as we were similar in points after a few races he continued to progressed and finish in the top 3 more regularly when I ended up finding my regularity in the last 6 of the 11 boat fleet. As the wind increased I decided to play safe and purposely didn't engage with the pack at the start as I decided to get a clearer start at full speed at times on port at the windward end to then tack and arrive on starboard on the pack. Kinda worked but I paid cash as this never got me in the top at the weather mark. A compromised I was not happy but conscious about and accepted as on doesn't handle an A class like an IOM. But my objective there as my first racing experience in that class was to learn and got I learned plenty. The A class skippers are a great bunch of people and I was glad to have met them. Happy to share tuning tips and advices which are always welcome. Doesn't matter how many years sailing I have I always learn. Time to pack and for me to remove all those stickers from the hulls and deck patches to unveil what's hiding underneath. And actually I didn't find anything major. Clearly the deck patches had not been removed for years as the deck varnish came up with the patches. That's ok – I need a good sanding and re-varnish of the deck. But I will check every fitting in the process as we're also not talking about the same pressure as other model boats. Time for the prize giving and to no surprise Peter wiles won, ah well we live another day and this gives us something to aim for. He is a great sailor and knows his boat so well too. He is very smooth at sailing her and he remains calm despite others colliding with him on the odd occasion. Overall, wow... what an experience. And I'm the proud owner of an A class boat. The 5th in this country this year. Oh yes forgot to mention this is a brand new model boat class. Thanks to Brian who gently convinced us that they're great boats and worth getting involved... Thanks Brian now I have a 2m long boat in my workshop. As if I had plenty of space! But you know what I loved it and can't wait for the next outing, probably amongst ourselves to get more on-the-water time to get to know more about these majestic beauties. Want to know more about the A class, see its history which started in the early 20's and which is now complementing our IOM and Dragon Force fleets then visit our new class website at www.aclassireland.org. Yes they are big but by god they are majestic on the water and the price tag doesn't go along with its size as they are no more expensive than other smaller model boat classes. Keep in touch as we'll be posting more as get to learn and sail these boats.